With such expressive eyes, it is easy to imagine the modern version of Mona Lisa. You would not know by her confident demeanor and warm smile the gut-wrenching pain and sorrow she harbors in her heart. Malalai was born and raised in Kabul at a time when life was relatively comfortable and free and girls were allowed to go school and attend the university. 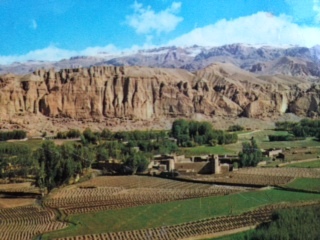 The town had parks, trees, vegetation, and had not been devastated by the Russian bombing raids, by the Taliban’s purposeful destruction of any remnant of history and culture, and by the fighting between the liberating American troops and the Taliban. The Taliban was born as a resistance movement to free Afghanistan of Soviet troops, following the Soviet invasion in 1979. Aided by the United States and Pakistan, the Afghan Mujahedeen injured and killed many Russians. According to the New York Times, the Soviet Union lost 15,000 soldiers over a ten-year period. Three years after the Soviet troops withdrew from Afghanistan in 1989, Afghani Mujahedeen led by Massoud took over the country and overthrew President Sayid Mohammed Najibullah who was backed by the Soviets. The Taliban was one of the Mujahedeen factions fighting for power to fill the vacuum left by President Najibullah. The Taliban faction was composed of Sunni Muslim Pashtuns. Pashtuns are heavily concentrated in the North-West Frontier Province. The command center for the Mujahedeen fighters who were battling the Soviets was located in this province. The draconian Taliban, who ordered windows painted black and women dressed in blue burkas, whipped women mercilessly if they happened to show any skin at all. Girls could no longer go to school. Music, art, painting, photography, and films were forbidden. 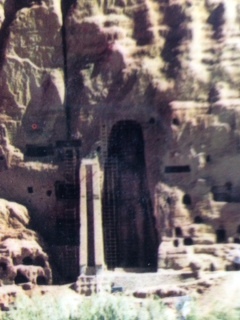 Mullah Mohammad Omar ordered the destruction of the two famous Buddhas of Bamiyan. They were dynamited and destroyed in March 2001 in spite of vehement international protests and offers to save them from demolition. 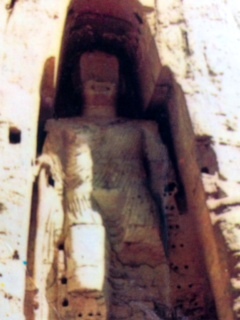 The priceless sixth century statues were carved into the side of the Bamwam valley in the Hazarajat region of central Afghanistan, 140 miles northwest of Kabul. Both statues were examples of Gandhara art and were built in 507 A.D. (the smaller one, 35 m tall) and 554 A.D (the larger one). The Taliban government declared these priceless statues “idols.” It is still painful to watch David Adams’ film, “Journey to the Ends of the Earth,” showing their obliteration. Little remains of the beautiful Paghman Gardens, outside of Kabul, formerly decorated with a Roman style triumphant arch. People relaxed on weekends there, bringing their families for picnics; the dress code was European. The night our tragedy happened, the Taliban was sending men around, ordering people to board up their windows or paint them black to conceal light and the silhouettes of women inside the house. We could hear bombing again. We never knew who was bombing, they were bombing constantly. My mom heard a knock on the door at 10 p.m. My brother Nasir answered the door – it was one of my nieces asking him to go to their house. During the bombing raid, her mother, Hamida, was wounded and her 13-year old daughter Shkeeb had been killed by shrapnel. Nasir bandaged Hamida the best he could to stave off the bleeding and drove her six hours to an open “hospital” and had to leave her there and return home. Hamida stayed in a coma for six months from the wounds received that night. My brother drove back to Kabul to take care of the funeral for our 13-year old niece. From the horrible shock, my father, Aslam, passed away that same night as well, probably from a heart attack or stroke. Nasir was going to bury my dad and my niece as soon as they got permission. The next day, he was painting the windows black as the Taliban had ordered, and a bombing raid started again. Mom said that my brother walked from the window towards her; he was pale, wobbly, and speechless; mom became concerned and asked what happened because he looked rather strange; he grabbed my mom and that is when she saw that a piece of shrapnel had pierced his heart. Blood was oozing from the hole. Nasir was 34 years old. My mom was with him all night. In the end, neighbors had to help bury all three family members, my niece, my dad, and my brother, in the mosque nearby because the cemeteries were too far. After six months in a coma, my sister Hamida, her three remaining children, and my mom crossed into Pakistan where she underwent three operations. When she was stronger and could talk and walk, she was told of Nasir’s death and of our dad’s passing in 1993. Hamida lives in Vancouver now. She was granted asylum in Canada during her stay in Pakistan when she was treated for her wounds. While in a Canadian hospital, as they were attempting to remove more shrapnel lodged in her body, Hamida found out that she had breast cancer. While undergoing chemotherapy, her only son, 24-years old, was killed by a drunk driver. Hamida is cancer free now and lives with her two remaining daughters. Malalai was spared the gruesome details, she was already in the U.S. when she received the dreadful telegram one day. She came to the U.S. in 1986 as a 22-year old sponsored by another sister. The government had given her a travel visa to come to the U.S. to help her dad with a painful back surgery that had temporarily paralyzed him. He went back to his wife and family but Malalai stayed with her sister. She found the love of her life through a college classmate and got married here. She never went back because she would have been killed as a defector. She can go back now to visit but she does not feel safe. Malalai had two brothers who were jailed during the Russian occupation, 8 and 4 years respectively. Their crimes were political, fighting the Russians. The Mujahedeen released them and both immigrated to the U.S. in 1996. Malalai’s youngest brother went back to Afghanistan for a very painful visit four years ago. The government found Hamida and asked her to come and disinter her daughter, her brother, and her father’s remains from the mosque and bury them into a cemetery. Sawyar, the 40-year old youngest brother went instead. He was very depressed, he would not talk about his visit for a long time. He was very quiet and did not want to socialize. He said, he was shocked, graveyards were everywhere, even by the airport. Every mile after mile had graves. It was worse than what he had seen 8-9 years before. And the Taliban is coming back.